Namely flour and butter. Lots and lots of butter. And while many of the recipes available online use words like “difficult,” “time-consuming,” or “painstaking” (geez! ), I found the process to be none of those things. Making puff pastry is no more difficult or time-consuming than making pie crust (or sugar cookies, if that’s your thing). Plus if you don’t misread the recipe and add (ahem) three times the amount of salt required, your homemade puff pastry will be infinitely better than anything you can afford to buy at the grocery. 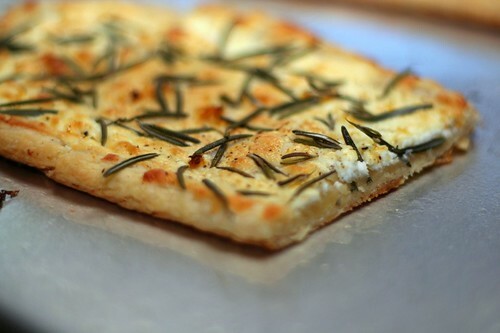 And then you can do all sorts of wonderful things with it, like slather it with goat cheese and sprinkle it with rosemary and eat it very slowly, dabbing your finger around after errant flakes of pastry and contemplating the magical union of flour-salt-butter-water while your goat-cheese-hating boyfriend, who is supposed to be enjoying his very own frozen pizza, interrupts you every few minutes to sheepishly ask, “Hey, can I have another little bite of that?” And because you love him very much, you will simply smile and pass him a slice without even the slightest trace of smugness. 1) Place the flour, sugar (if using), and salt in the bowl of a food processor and pulse to combine. Add ¼ of the butter cubes and process until the butter is in dime-size pieces, four 1-second pulses. Add the remaining butter and process to coat the cubes with flour, two 1-second pulses. Transfer the mixture to a large bowl. 2) Combine the ice water and lemon juice in a small bowl. Sprinkle half the liquid over the flour and butter mixture and toss until just combined. Keep adding the liquid, 1 tablespoon at a time, until the dough clumps together in your hand. Turn the dough out onto your nice, clean countertop. It will be pretty dry and shaggy at this point. 4) Brace the heel of one hand against the countertop and drag small portions of the dough forward in short brisk strokes, forming a large clump. Gather the dough together and repeat this process a second time. (here’s a nifty little illustration) Press the dough into an 8″x4″ rectangle, wrap in plastic and refrigerate for an hour. 5) Sprinkle your countertop with flour and roll the dough into a 15″x10″ rectangle. Fold lengthwise into thirds. 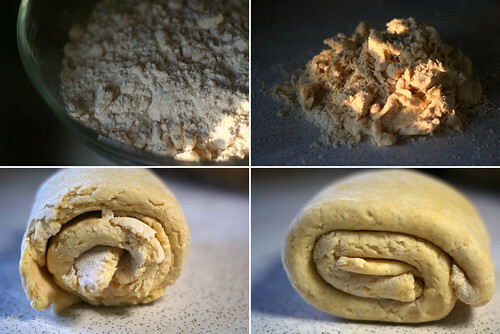 Starting from the narrow end, loosely roll up the dough as you would a pair of socks (for example). Press it to form a 6″x5″ rectangle. Repeat this process, first chilling the dough if it’s soft and sticky. When the second folding, rolling and flattening is complete, return the dough to its plastic and chill for at least an hour. 6) That’s it, you’re done. The puff pastry dough will keep in the refrigerator for two days or in the freezer for one month. 1) Preheat the oven to 450°F. Crumble the goat cheese into a small bowl. Add the cream and lemon zest and mash together with a fork to combine. 2) Lightly flour your countertop and roll the puff pastry out into a 12″x17″ rectangle. Dip a pastry brush (or your finger will work just fine) in water and brush a ¾” border around the pastry. Fold the edges in and press to create a border. 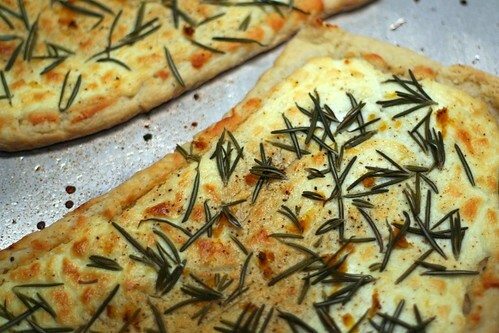 3) Smear the cheese mixture evenly inside the borders of the pastry and scatter the rosemary leaves over the cheese. Grind a little black pepper evenly over the top. Bake until the tarts are puffed and golden brown, about 15-20 minutes, rotating the pan halfway through baking. Slice and serve hot. This entry was posted on February 8, 2009 by Megan @ When Harry Met Salad. It was filed under baked goods and was tagged with fall, goat cheese, puff pastry, rosemary, savory, tart, winter. This rocks. Thanks for including such specific instructions about mixing the dough in the processor. Cutting in butter manually is a pain and I’m not good at it, but I’m afraid to make pastry in the processor for fear of overmixing. I wish I had my own fresh rosemary. Or fresh anything – stupid winter. Good info, plus a yum factor. Did you know Bittman has a new cookbook out…Food Matters. He’s my rock god of the cooking set. But I go to Anthony Bourdain when I’m looking for an edgier food fix. Have you ever read Ruth Reichl? Her books, Tender to the Bone and Comfort me with Apples are great reading. Beautiful! Amanda hasn’t made a puff pastry in a long time–I’ll have to ask if this recipe is simpler than the one she used to work from. I have never attempted it. I don’t have a food processor, but I recently read the tip of freezing butter and using the grater to add it, so that you avoid all of the time consuming and annoying cutting in. I like to line a tart pan with puff pastry, smear a little mustard on the bottom, then some finely chopped garlic, add some swiss cheese, and finally top with tomato slices, a little fresh basil and a slug of good olive oil. A French friend from years ago taught me the recipe and it is to die for and simple. This, by the way, looks so damn good. I wish I could get fresh rosemary. Something else to try with my new stand mixer! For me the jury is out on which is less work… cutting in the butter with a pastry cutter or taking out the processor, using it, washing it, and putting it away again. Do you use whole wheat pastry flour? I have never used it, but I bought some recently. I think your post has inspired me to try it. We have an abundance of eggs – perhaps a quiche is a good idea today. Do you grow your rosemary? I used to have a pot of rosemary when I lived in the cold country – but it was tough to keep it from turning to sticks by this time of year. Here I have rosemary shrubs in my landscape and they are blooming right now. I take them for granted. These comments remind me how lucky I am. Clare – Check the plastic packages of herbs at your grocery — I bet they come from somewhere in Illinois which, while not exactly local, is better than California. Pat – Thanks for the visit! I’m familiar with Ruth Reichl but I haven’t actually read her. History in a Glass is on my shelf. . .I’ll have to check it out. And I keep meaning to look at Bittman’s new book, although it strikes me as an Omnivore’s Dilemma knockoff. Bubs – I think this is actually cheaters puff pastry. The real deal involves somehow rolling out a stick of butter. Lu – I’m gonna have to try both of those things. And maybe you could grow rosemary on a balcony or something? Kristi – Jealous. 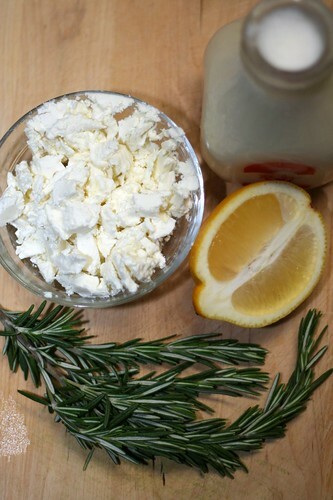 . .
How can you hate goat cheese? Jesus. I would like to say thank you! I have been dying to make my own puff pastry but have been hesitant about it for a while. This give me the encouragement to go ahead and give it a try. Thank you, again. And the tart sounds amazing. I will be trying it very soon. Wow this sounds fantastic! I love any meal that includes puff pastry but was always afraid to make my own – it always seemed so intimidating. Thanks so much for the post and the reassurance that puff pastry isn’t so terrifying, I’ll have to get cooking this weekend.